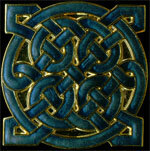 I have always wanted to adapt, (or actually, re-adapt) Celtic design to the enamel medium, but until recently I never felt we had a broad enough marketing network to digest something that far a field from our regular designs. Also, as you will gather when you see the pin, the enamel work is a rather substantial challenge. But curiosity finally got the best of me and I thought I would try something 'simple' as an experiment, to see how my engraver and enamelers reacted to the challenge. As you will agree when you see it, it far exceeded my expectations and I decided immediately to commit it to production in two color schemes (red or blue and gold). So, I hate to confess, but this design originally put forth as a technical experiment, is not my own, but is pretty much a direct steal, not just from the Celts (the Picts actually) but from the amazing George Bain who, back in the '40's and '50's, was somehow was able to collect and deconstruct the ancient Celtic knotwork designs and develop a basic scheme for the rest of us to try to get a handle on how to reproduce, and/or make our own designs, and, he hoped, keep the design tradition alive. Indeed he states that the ultimate aim of learning these design techniques should be the application to some form of craftwork. Well, George, here you are. For those of you interested in going blind and/or crazy trying to dope this stuff out, I can recommend Dover Books paperback reprint of his Celtic Art, The Methods of Construction 0-486-22923-8. Of course the whole "Arts and Crafts" movement, and to a very great extent, the even better known "Art Nouveau" movement is deeply rooted in the Celtic design traditions. (Blues: Jazz as Celtic:Art Nouveau if you will). This particular design is based on a panel drawn by Bain from the Pictish school and was apparently used on the "Colleiburn" (Sutherland), and "Glammis", (Angus) stones. NOBODY has been able to figure out how they did it. The Picts and Celts and so on. How, in say 1,000 B.C. did they draw and produce this stuff? I mean, apart from the complexity of the designs at any size, how did they execute it at the microscopic sizes they did? What did they use as aids to eyesight? light? what tools could draw so fine a line? One researcher reported "In a space of about a quarter of an inch superficial, I counted with a magnifying glass no less than one hundred and fifty-eight interlacements of a slender ribbon pattern formed on white lines edged (emphasis added) with black ones on a black background." The traditional answer is that these unerring lines, obviously not possible by humans, were drawn by angels. These designs were not intended, by the way, for human consumption. I mean, who's gonna see, let alone appreciate those 158 lines of knotwork? The whole quarter inch piece would look like a bug running across the page to these increasingly decrepit eyes. No, these designs were intended to be appreciated by whoever, or whatever was passing for God in those days, and were worked solely to glorify him, or her, or it, or them. And if you want an insight into the traditional Scotch/Irish sensibilities which probably by now amount to a genetically implanted sense of guilt, you should know that it was considered that this other worldly craft judge would detect errors, and mistakes were not tolerated. (That's why you get such great service from Susan, the Orkney woman, and me, a secret McGraw.) None of this alleged Native American 'spirit bead' stuff for them. (One odd bead in the pattern to show one was not arrogant enough to think a job was 'perfect'. Ha!) According to Bain, representations of any of the works of the 'Almighty Creator' [sic] were forbidden, and so, it is not until much more recent times that zoomorphics or representations of humans began to show up. Well, I have to cut some of these fascinating discussions short, so I'll let you delve into this on your own if you are interested. In the meantime, we have a really wonderful pin here that is worthy of any fancy Museum reproduction catalog at about a third the price they would charge. It is beautiful and interesting, but very conservative and subtle which some people seem to like. It would function well as a scarf pin I should think. SIZE: 1.5"x1.5"